Well, it’s official. This blog is public (insert scared face here!). I would consider this a very soft launch of the site. I am still trying to figure out exactly how to use wordpress, but for the time being, I can’t lose any time in my quest to make gourmet ice creams. The show must go on! Also, some of you may comment that the above quote doesn’t really describe ice cream. It’s really a way to pay homage to one of my favorite singers, Sarah McLachlan, and I also thought it apropos to dedicate it to The Husband. After all, today’s ice cream flavor is a gift to him. Poor guy, I’ve been making all these (sigh, it’s only been 2!) flavors that really are not to his liking (we’re working on broadening his ice cream horizons). So this time I want to make something he loves. The Husband adores chocolate + peanut butter the way I adore anything caramel. Chocolate and peanut butter really are a perfect food combination, a match made in baking heaven. After doing a bit of research, consulting epicurious , the food network, the cuisinart recipe booklet that came with my ice cream maker (I know, it sounds sort of strange), and the legendary David Lebovitz I decided that the best bet was to go with a peer reviewed recipe originally from Gourmet Magazine. It’s from 1996 (jeez, seems like eons ago, right?) so it’s really been out there for a while for people to adapt and remake. Yet, despite all this, the reviews were very positive, the only feedback was the it was too peanut-buttery (isn’t that the point?). So I fused this recipe with a David Lebovitz recipe which yielded a yummy concoction. The reason for this fusion is simple – I wanted to create something that was lower in fat (David’s recipe called for 1/2 and 1/2), slightly less peanut-buttery (the Gourmet Magazine recipe called for 1 cup of peanut butter, David’s called for 3/4 of a cup), and I wanted to add peanut butter cups (which neither did). Below is the combined recipe. Tell me what you think! 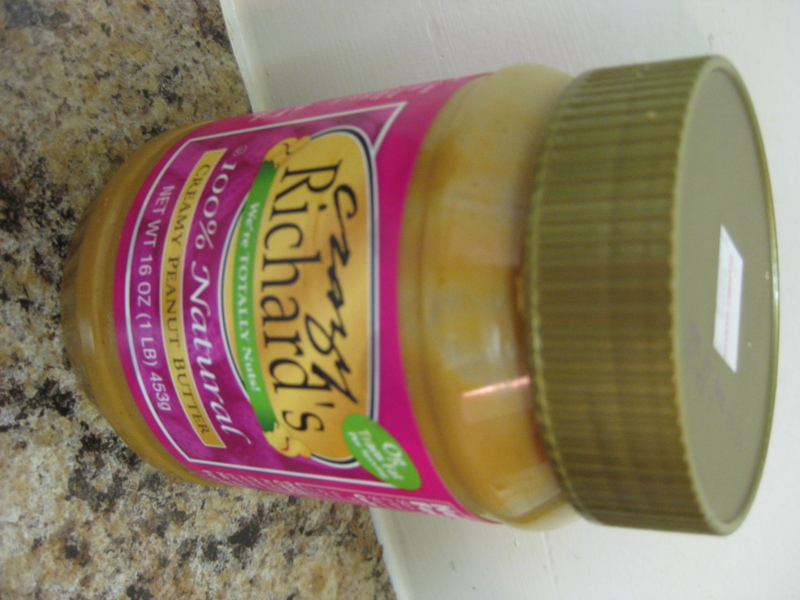 Natural peanut butter (Trader Joe's is one of my favorites, but this one still did the trick). All the ingredients mixed together. 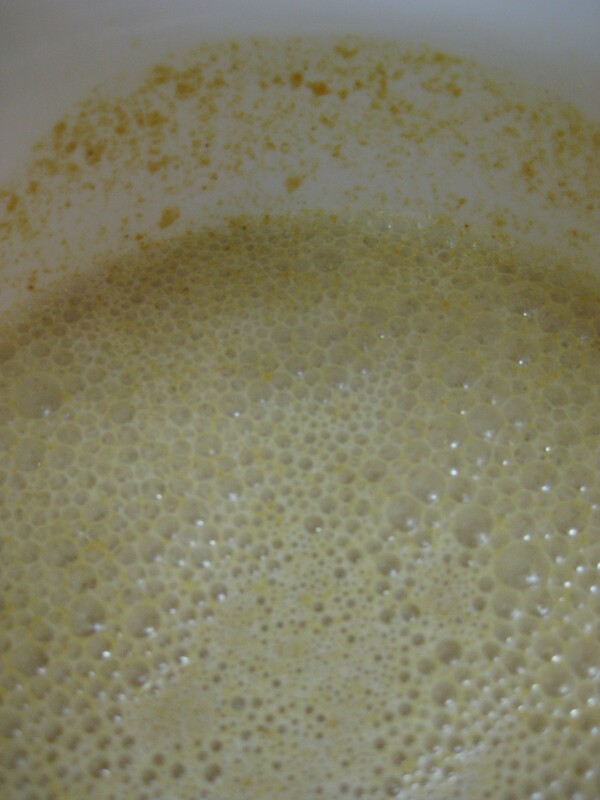 VERY frothy with the milk and peanut butter. Using a hand mixer, blend all ingredients (except for the peanut butter cups) together. Let it cool completely in the refrigerator for an hour. Remove the mixture from the refrigerator, pour it into the ice cream maker and churn for 20-25 minutes (for some reason this one took slightly longer to churn than the previous two recipes). 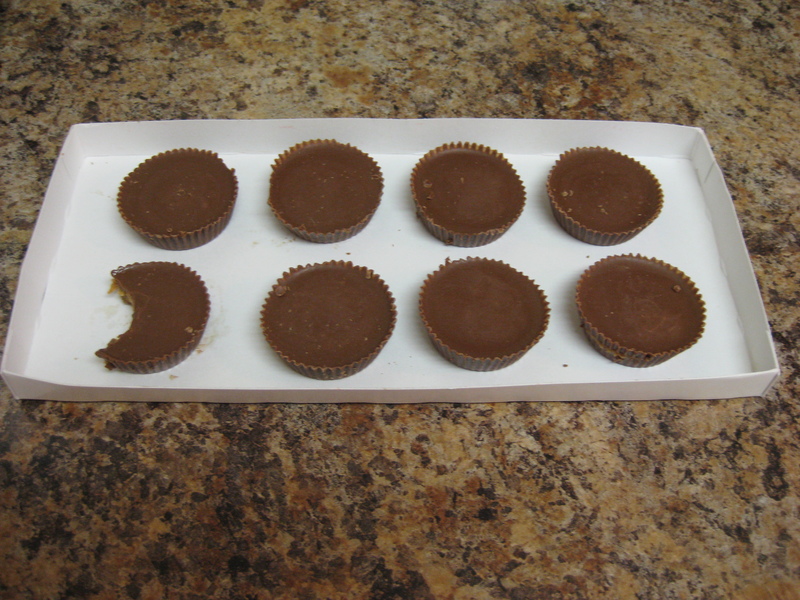 Two to three minutes before you are finished slowly pour in the small bits of peanut butter cups. I am incredibly impatient and kept checking the ice cream every few minutes but it was a good thing because 1/2 way through the churning process it looked like the peanut butter and milk were separating slightly. (I think that’s because I used natural peanut butter – a decision I do not regret.) Don’t be alarmed though because by the time it was done churning the ice cream was fully mixed. 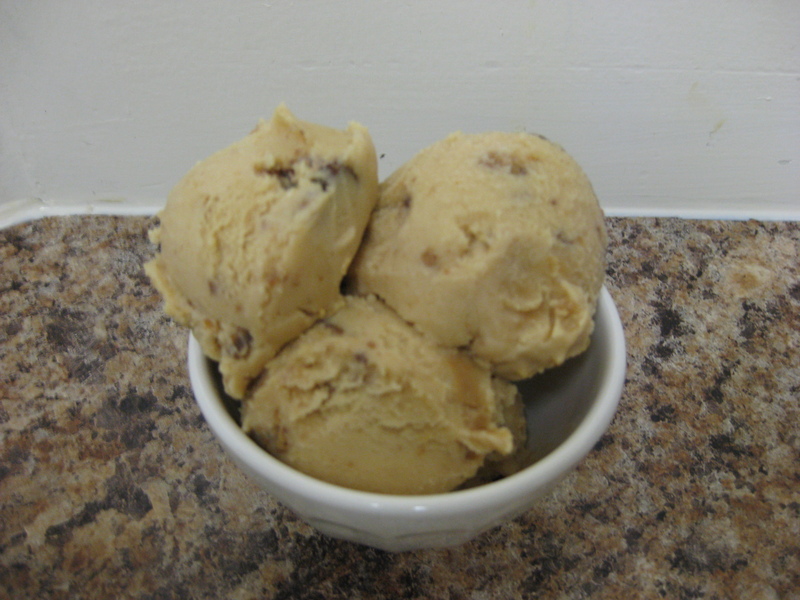 Some of the peanut butter did, however, get stuck to the inside of the ice cream maker, but these small chunks were tasty little surprises when eating the finished product. Oops... I could not resist one of those peanut butter cups! The ice cream was very soft and creamy when it was finished but definitely needed to be frozen for a few hours before it tasted like the perfect ice cream consistency. You’ll see from the pictures that it scooped perfectly after being frozen over night. The ultimate compliment came when he asked to keep the entire quart at home for himself (in order to avoid sharing it with his office, as previously agreed upon). All in all, great success! Next time I may swirl in fudge to add an extra little treat. Next on deck… lemon sorbet. Come back and visit soon!! You are awesome! an awesome writer, an awesome ice cream maker, an all around awesome blogger but this is precisely why I will not be reading your blog. It is way too yummy sounding to resist. Only a skinny minny like yourself could have an ice cream blog, and I mean that in the most complimentary way. On the day that you make me ice cream (something with peanut butter and chocolate preferably), that day, and that day only, will I read your delicious blog. This blog has inspired me to write my own: “How to gain 400 pounds in just 4 weeks!” I am not complaining. Jaina – we had agreed that there was too much ice cream in the house, so he’d share that flavor with the office. The Husband rules with an iron fist when it comes to sharing frozen treats, and we both know you can’t negotiate with a terrorist! We owe you one!